Russell Greenberg really puts the heir in heirloom. 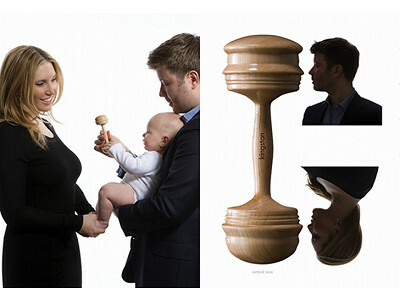 The graceful contours of his custom-made wooden baby rattles aren’t based on random curves. They match the profiles of special people, such as a child’s parents, grandparents or siblings. Profile photos of the loved ones serve as a guide, and Russell shapes the ends of the rattles into their likenesses. Each maple rattle is hand-turned on a lathe and finished by hand in his Long Island City, N.Y., workshop. There are computer-aided machines that could carve a person's profile into a wood form, but for Russell, the joy comes from crafting each piece by hand. 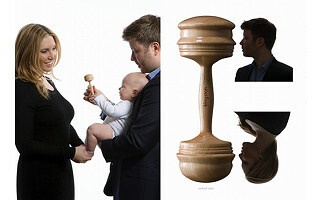 He started creating profile-inspired objects after designing his own wedding ring, and he came up with the idea for a rattle after the birth of his son, Kingston.Russell’s baby rattles are incredibly personal, sentimental and meaningful. It’s a gift that parents will treasure… and babies will enjoy gnawing on until they’re old enough to appreciate the beauty of the timeless keepsake. It's an honor to have Cameo by Rux be a Grommet. Especially for a product so near and dear to my heart. These rattles literally could not be any more personal for me. I designed and carved the first one myself for my son one year ago. Some gifts need to be a labor of love because they are the only way to truly say how much you care about someone. The Cameo by RUX custom rattle is this kind of gift. Each one is designed and hand-carved in our New York City workshop. I think we forgot to mention that you can also customer engrave the beautiful RUX rattle with up to 24 characters, most likely with the baby's name but I suppose it could also be the names of the recipients. I appreciate that touch. Russell Greenberg really puts the heir in heirloom. The graceful contours of his custom-made wooden baby rattles aren’t based on random curves. They match the profiles of special people, such as a child’s parents, grandparents or siblings. Profile photos of the loved ones serve as a guide, and Russell shapes the ends of the rattles into their likenesses. Each maple rattle is hand-turned on a lathe and finished by hand in his Long Island City, N.Y., workshop.